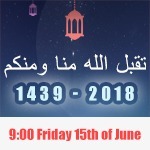 Brothers and Sisters, Alhamdulillah, Eid Al Fitr 2018 will be on Friday 15 June InshaAllah. As always, we welcome all of you to join us at Croydon ICT for Salaat Al-Eid and to celebrate this joyous occasion within our community. The Salaah will be at 9:00am InshaAllah. May you all enjoy the beauty of Eid with family, friends and loved ones, and May Allah bless you all, ameen. It will be a very busy morning. Brothers and Sisters therefore need to follow the instructions of CICT stewards who will be on hand to monitor the crowds. Please arrive EARLY – Salaat Al Eid will commence at 9:00AM sharp. This entry was posted in Article, Events, News by Croydon ICT Management. Bookmark the permalink.